Two-Step Login pairs something you know (your HawkID and password) with something you possess (usually a mobile phone). It prevents unauthorized users from accessing your accounts with stolen HawkID credentials. Use Two-Step Login profile management tools (https://apps.its.uiowa.edu/uip-tools/two-step) to enroll new devices, establish backup methods, and enable applications. Find detailed instructions for adding devices and login methods below. 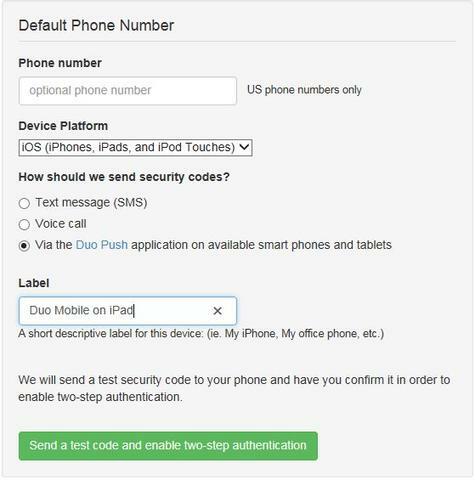 ITS recommends using the Duo Mobile app on a mobile phone or tablet as your primary Two-Step Login method. We also recommend you enroll your home or office phone number as a backup device. Note that text and phone call methods result in charges to the university. Push notifications to the Duo Mobile app save you time and save the university money. For this process, you’ll need a phone or tablet and a computer, both with internet access. Search for the free Duo Mobile app in your device’s app store. Download and install Duo Mobile. Keep your device handy to complete the process. Using a computer, go to https://apps.its.uiowa.edu/uip-tools/two-step. If setting up your profile for the first time, you’ll see a green “Setup Two-Step Authentication” button. Click it. Enter a phone number if you choose. You don’t need a phone number if plan to use push notifications to the Duo Mobile app to complete your logins (the preferred method) or if your device does not have phone service. Select the appropriate device platform from the drop-down list. Assign a label or name for this device. A barcode and instructions will appear on your computer screen. Part 3: Complete the process. Open the Duo Mobile app on your phone or tablet. Tap “Scan Barcode” and use your device’s camera to scan the barcode on your computer screen. On your computer, click the “Verify Duo Push Activation” button. Look for a “Request waiting. Tap to respond.” prompt In the Duo Mobile app on your device. Tap the prompt, then tap the “Approve” button. Your device is enrolled. Adjust any other profile settings (e.g., enable any opt-in applications) then log out of the Two-Step Login profile management site on your computer. Entering a 10-digit number will let you bypass the error. The phone number will never be used so long as you click the form’s “Duo Push” radio button. In the “Two-Step Devices” list, click the device you want to update (i.e., the device with Duo Mobile newly installed). A “Duo Push Options” window will open. Click the blue “Enable Duo Push” button. Your device now is set up for Duo Mobile push notifications. Adjust any other profile settings (e.g., enable any opt-in applications) then log out of the Two-Step Login profile management site on your computer. For this process, you’ll need to be near the phone you want to enroll. You’ll also need a computer with internet access. Note that you can only enroll a phone number that’s unique to you. If someone else has already enrolled the number, you won’t be able to add it. Completing a login with a phone call results in charges to the university. We recommend using push notifications to the Duo Mobile app as your primary login method. Whenever possible, use phone calls only as backup methods. Using an on-campus computer, go to https://apps.its.uiowa.edu/uip-tools/two-step. An “Add Device” window will open. Enter the phone number you’re adding, click the “Voice Call” radio button, and enter a label or name for this phone number. Click the blue “Add Device” button. A verification window will open. You’ll receive a verification call at the phone number you’ve added. Answer the call and make note of the one-time security code. Your backup phone number is enrolled. Adjust any other profile settings (e.g., enable any opt-in applications) then log out of the Two-Step Login profile management site on your computer. Completing a login with a text message results in charges to the university. We recommend using push notifications to the Duo Mobile app as your default login method. An “Add Device” window will open. Enter the phone number where you want to receive text messages, click the “Text message SMS” radio button, choose your device’s platform, and enter a label or name for the device. Your device will receive a text message with a one-time security code. Keep this message until you’ve completed verification. Your phone number is set up to receive text messages. Adjust any other profile settings (e.g., enable any opt-in applications) then log out of the Two-Step Login profile management site on your computer.